Denote feedback, set next steps target and mark using the literacy checklist for PEEL, grammar, spelling, presentation and more. 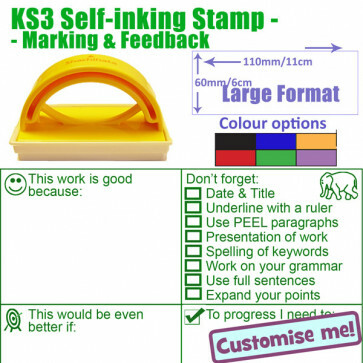 With one stamp you can mark 8 literacy skills AND denote 3 areas of feedback inc WWW and EBI - all on one large format, handy school stamp. Available in choice of ink colours. Customise wording in this design in 3 easy steps - 1. Select the custom option below, 2. Checkout, 3. Send your amendments, quoting your order number using our chat facility or by email to info@classroomcapers.co.uk. To alter the design layout our Custom Stamp Option needs to be purchased - Click here. 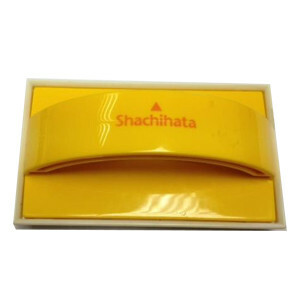 Quality guarantee: Xstamper guarantee the quality of the stamp impression, full exchange available if not happy within 30 days. Will last for approx. 2,000 impressions (stamps). Please note: this stamper is NOT reinkable. 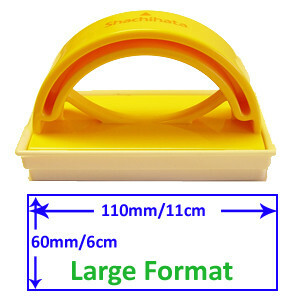 The large handle of this stamp makes it easy to use and the stamp sits in a snug fitting tray which keeps the stamp face dry, safe and also enables it to be easily transported. The stamp will last for 1000s impressions (uses) but is not reinkable. Read our article on how to maximise the life of your stamp - Stamper usage and guidelines - click here.